Enjoy a juicy BBQ bacon cheeseburger with all the extras. 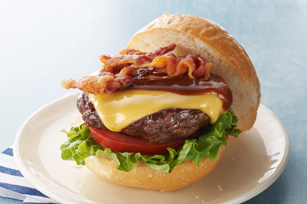 All-American BBQ-Bacon Cheeseburgers feature melty cheese, crispy bacon and great BBQ flavor. Reserve 1/4 cup barbecue sauce. Shape meat into 4 (1/2-inch-thick) patties. Broil, 4 to 6 inches from heat, 7 to 9 min. on each side or until done (160°F), brushing occasionally with remaining barbecue sauce for the last few minutes. Top with Singles. Broil 1 min. or until Singles begin to melt. Fill rolls with lettuce, tomatoes, burgers, reserved sauce and bacon. Serve with CRYSTAL LIGHT Iced Tea and coleslaw made with MIRACLE WHIP Dressing. Prepare using ground turkey and KRAFT 2% Milk Singles. Prepare using KRAFT DELI DELUXE Cheese Slices. Substitute 1/4 lb. (4 oz.) VELVEETA®, cut into 4 slices, for the Singles. Substitute OSCAR MAYER Fully Cooked Bacon for the cooked bacon slices. To grill meat patties instead of broiling them, heat grill to medium heat. Reserve 1/4 cup barbecue sauce for later use. Grill patties 4 to 5 min. on each side or until done (160ºF), turning and brushing occasionally with remaining barbecue sauce the last few minutes. Top with Singles; grill 1 min. or until Singles begin to melt. Continue as directed. Substitute 1/4 lb. (4 oz.) VELVEETA®, cut into 4 slices, or KRAFT DELI DELUXE Cheese Slices for the Singles.